British mobile phone retailer Carphone Warehouse is one of the popular stores and online websites to go to when you need a smartphone, tablet etc. Operating in both Ireland and the United Kingdom many deals are always up for grabs, especially on Black Friday. In previous years the Carphone Warehouse Black Friday offerings were amazing, on sale was the Samsung Galaxy S7 where contract prices were very low. They also had on offers as part of the Black Friday bonanza on other brands such as HYC, Sony and more. CW is a subsidiary of Dixons Carphone and has been since August 2014, basically merging both Dixons Retail and Carphone Warehouse Group. Are you ready for Carphone Warehouse Black Friday deals in November? Visit Carphone Warehouse for all your Black Tag deals when they become available, all deals will be listed when live. What will be the exact Black friday Sale date at Carphone Warehouse. What would be good is that you can get the Google Pixel 3 during the Black Friday sale event. Mark the 23rd November 2018 in your diary because this is when the Black Friday or Black Tag event deals will commence. WOW thanksto the Black Tag Event you can bag a iD Sim with 500MB Data, 250 minutes and 5000 texts for just £4 per month, this would be ideal for my mum and dad. You can save up to £200 on pay monthly phones and SIM free phones. No they will be starting its deals on November 24th according to the official website. They have just confirmed it was a great spot and are getting in touch with the website team. Is Carphone Warehouse only having a Black Friday Sale on the Saturday 25th, which is what they are saying on its website. Yeah I saw this too, it says 2017 so it is this year lol. Wonder why they are doing on Saturday as that defeats the object of calling it Black FRIDAY. The Carphone Warehouse Black Friday landing page says that we should put 25th November in our calendars, but this is not a Friday its a Saturday. There is a cool £100 off the SIM free PRIV by Blackberry, it is now just under £300. The top contract deals inlcude many savings, which include: Samsung Galaxy S7 £200 saving, Apple iPhone 6s save £200, Galaxy S3 £100 and many more. They have 8 big deals on contract phones. Actually you missed out 2, so there is 10. The top contract deals include many savings, which include: Samsung Galaxy S7 £200 saving, Apple iPhone 6s save £200, Galaxy S3 £100 and many more. They have 8 big deals on contract phones. The Black Friday deals have a countdown clock to its end, which is this week. The deals range from pay month, pay as you go, accessories and sim free. My fave deal has to be the £200 saving on the Samsung Galaxy S7 with no up front costs and only £24 a month which includes many colour choices as well as 32Gb 500MB 4G data, 500 minutes and unlimited texts. 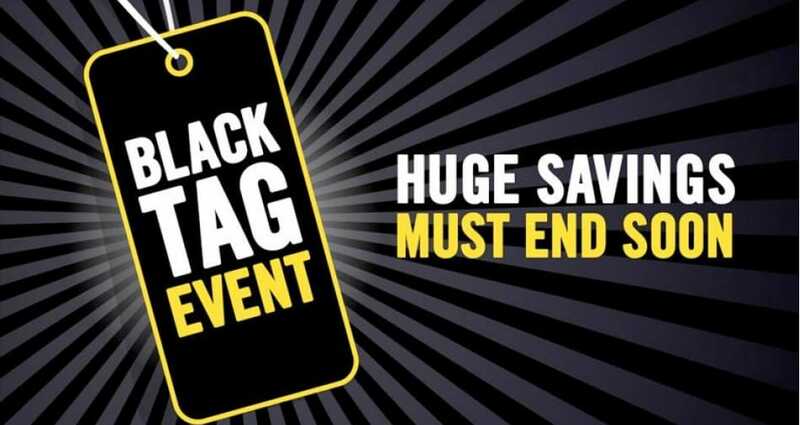 In store and onine the Carphone Warehouse Black Tag Sale Event has gone live and the black and yellow theme looks good. I am so hoping I can get the iPhone 7 PLus a lot cheaper on contract during the black friday event. You can re-register your interest over on the official Carphone Warehpuse Black Tag Event page. This confirms that they will be taking part in the sale from November 25th. Just seen that when CPW begins its Black Tag Event on Black Friday Nov 25, they will be bringing fantastic offers as well as free next day delivery and of course its price promise. Are you getting ready for the official Carphone Warehouse Black Friday sale, which they call the Black Tag Event? Starts on November 25th. Carphone Warehouse has now made it official on its website that they will be taking part in the Black Friday Sale for 2016. Get ready for some amazing phone deals etc > http://bit.ly/2cylX7u. The top 10 deals will be list on our website here. The Carphone Warehouse has what they are calling the UK’s biggest mobile sale on. Deals from just as little as £5 per month for a smartphone. I am so looking at buying a new Android phone, have you any ideas what sort of discounts CPW will be offering during its Black Friday sale? I hope CPW will have a great deal for the Blackberry Priv next week! Get the Samsung Galaxy S6 edge 64GB for the price of 32GB for only £32.50 per month with upfront cost of phone being under £30. I have just seen there are 13 phones you can get over at Carphone Warehouse, which all come with a free £300 gift card to spend at Currys PC World. Please tell me i can get my hands on the Huawei Mate S cheaply. Get the Samsung Galaxy S6 with 1GB data with no upfront cost for only £27.50 per momth. Get up to £300 gift card to spend over and Currys PC World. All you need to do is get a new phone on contract and away you go. I am sitting patient for the iPhone 6S, hopefully The Carphone Warehosue will have some sort of deal going on from November 27. I wont hold my breath though. I would love to get my hands on the Samsung Galaxy S6 this year, no upfront cost would be fantastic. I got the Samsung Galaxy S5 last year and you are spot on with the up front cost, it was the best deal of my year i can tell you.